I wish I had some childhood story of crunching down on soft shelled crabs in the summer, but alas, Ohio is not known for its crabbing industry. In fact, I never had a fresh crab–soft shelled or not–or indeed ANY fresh shellfish outside of a Red Lobster growing up. In fact the only fresh fish (as in, I held it in my hands as a whole fish) I remember having was caught by my Grandpa Cooper and me in the pond behind their farmhouse. We only caught one or two small [insert fish type here-frankly I couldn’t tell you]. After Grandpa cleaned it (a process I witnessed through half covered eyes), Grandma announced it would make a fine breakfast and whisked it off to the kitchen to be soaked in milk overnight to get rid of the “fishiness.” In the morning, I awoke to the smell of frying. She’d dredged those little filets in corn meal and flour and had them in a cast iron pan laced with, no doubt, shortening (*gasp*) or lard (*gasp* with hand to throat), or maybe a combination of the two. And although it seemed foreign and strange to be having fried fish for breakfast, I proudly ate the bounty nature had provided my rod and reel for my breakfast. That’s about as good as it got as far as seafood in Ohio. Occasionally, my folks would drive to a neighboring town where one civic organization or another was having a Fish Fry (always on a Friday, though the county was nearly entirely Protestant). And lord knows I loved Long John Silvers, with their thickly battered filets nested on a bed of crunchies, or “Krumbs” as they were known, the pieces of fried breading which would break off, leaving piles of them in the food warmers. In the 70s, LJS briefly centered an advertising campaign around these delectable bits of golden crunchiness–which I considered the best part of the meal, frankly– and I never failed to ask for extra Krumbs on those special trips to that pirate-themed mecca of all things batter-dipped. Later on, my younger sister was part of the Opening Day crew at the first Red Lobster within a day’s drive of the farm. But by then, I was out of college, and my Ohio seafood days were over just as seafood was rolling into our lives. Ah, but I’ve since fallen in love with fresh seafood from all over: fish tacos in California, oysters in Seattle, Maine lobster rolls, and my first sushi in New York City. It was in NYC sushi shops that I was introduced to soft shelled crabs in my favorite roll, the Spider Roll. But it was years before I thought to buy some crabs and try my hand at them at home. But when I did, they were a revelation. And where did my first crab ideas take me? Right back to my Grandma’s dining table with that crunchy breakfast fish! So I give you a Po’ Boy and a take on Eggs Benedict suitable for any brunch table anywhere. And since you can get frozen soft shelled crabs now, you don’t have to be on the waterfront to make them yourself! 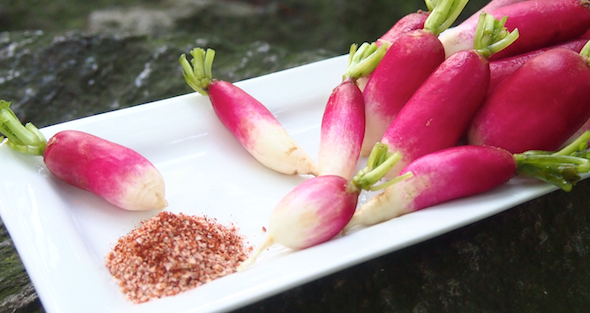 Perfect for topping off Deviled Eggs, dipping crisp radishes and scallions into, or adding a little savory finish to any dish! You can also use in place of salt and pepper in recipes. 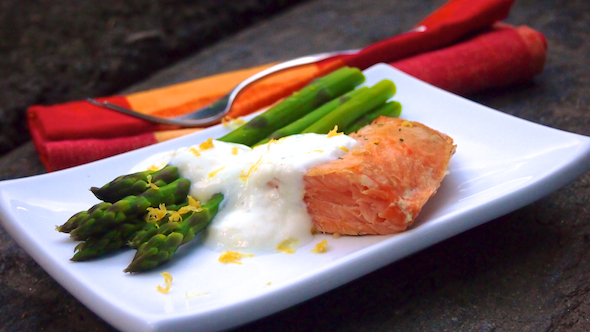 For the Healthy Greek Hollandaise, combine the yogurt, lemon juice and zest in a bowl. Add a pinch or two of kosher salt and a pinch of pepper to taste. Chill for a couple of hours to let the flavors party together. Now, on to the main event: the crabs! This process is made easier with some simple latex gloves. Lay them out on paper towels and pat them dry. Really dry, because these puppies splatter when they’re even a little wet. In a shallow bowl, combine the flour, corn meal and Smokey House Seasoning. In a large skillet, heat 2 tbsp olive oil over medium heat. When the oil is shimmering and hot, dredge 3 of the crabs in the flour mixture, lightly coating both sides, shaking off the excess. Stand back (tongs are the tool you need here. Trusts me on this. And an apron.) and place the crabs top-side down in the hot oil. Don’t move them for 60 seconds. Flip and allow the other side to cook for 60 seconds. That’s it! They’re done. If you got smaller ones, they’ll cook even faster. Move them to folded paper towels to drain. Sprinkle immediately with Smokey House Seasoning (or kosher salt). Repeat with the next batch of three. Slit open the rolls and drizzle a little Liquid Gold or extra virgin olive oil on both sides. Toast the buns open-faced in a toaster oven or broiler (WATCH THEM!). 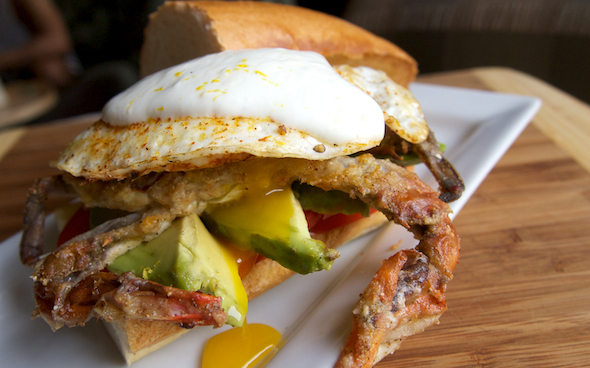 Once toasted, spread a little of the sauce on the bottom of the buns, layer on some sliced tomatoes (we like avocados, too) and top with the crabs. For added decadence, add a poached or over-easy egg, then top with the Healthy Greek Hollandaise. For a take on Eggs Benedict, pile the crab, a poached egg and the Healthy Greek Hollandaise onto a toasted English muffin!